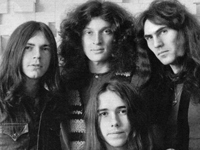 Best known in the U.S. for its hard rock material, Golden Earring has been the most popular homegrown band in the Netherlands since the mid-’60s, when they were primarily a pop group. The group was founded by guitarist/vocalist George Kooymans and bassist/vocalist Rinus Gerritsen, then schoolboys, in 1961; several years and personnel shifts later, they had their first Dutch hit, “Please Go,” and in 1968 hit the top of the Dutch charts for the first of many times with “Dong-Dong-Di-Ki-Di-Gi-Dong,” a song that broadened their European appeal. By 1969, the rest of the lineup had stabilized, with lead vocalist and multi-instrumentalist Barry Hay and drummer Cesar Zuiderwijk. They experimented with their style for several years before settling on straightforward hard rock initially much like that of The Who, who invited them to open their 1972 European tour. Golden Earring signed to The Who‘s Track label, which released a compilation of Dutch singles, Hearing Earring, helping the group break through in England. 1974′s Moontan LP spawned the single “Radar Love,” a Dutch number one, U.K. Top Ten, and U.S. number thirteen hit. The group toured America opening for the Doobie Brothers and Santana, but the lack of a follow-up ensured that their popularity remained short-lived in America, even though they remained a top draw in Europe over the rest of the 1970s.